Stand before her “Chrysanthemum Dance,” a glass flower blossom more than 2 feet wide, and you can feel a peaceful beauty in the curved petals that open out into space. With light shining down through the glass from above, the piece glows with a kind of cool moonlight. Yang’s work has attracted admirers from around the world. She has won numerous design awards, has taught classes at Corning Glass and was recently featured in a Chase Bank commercial as a recognized master. Yet she and her husband, Chang Yi (who manages the business end of things), believe that art isn’t meant to be hidden in museums, but should be displayed in galleries, public spaces and private homes where it can be enjoyed every day. promote an awareness of it. seen throughout Asia, Europe and the United States. The Costa Mesa gallery opened in April. water with a flower leaning over the surface. She is worldrenowned for her art, but Yang was once famous throughout Asia as an accomplished film actress. She won two awards as best leading actress at the Golden Horse Awards, and best actress at the AsiaPacific Film Festival in the 1980s. Her husband had a previous career as a film director. In fact, it was during their last film together that Yang became fixated on some glass art pieces that were being used as props–and soon wanted to try making her own. So the couple abandoned the art of making movies to apply their creative sensibilities to molding crystal pieces. It was a sharp learning curve – with a lot of experimentation and expensive breakage. “For years we knew nothing and had to experiment with each step,” says Yi. But in 1987 they started Liuli, and with a technique called pâte de verre, which involves wax forms and molds, furnaces and kilns, Yang creates her intricate glass objects – a baby resting in a hand, fish leaping out of the ocean, a flower seemingly rushing out of a wave. Today Liuligongfang employs about 1,000 workers worldwide, but mostly in Asia, and produces glassware, vases, figurines and jewelry in addition to the art pieces. Yang puts no limit on her dreams, and once she has a vision, she works until it becomes a reality. When the couple visited the famous Caves of a Thousand Buddhas in Laos in 1996, they were able to view a cave wall fresco of a Buddha with 1,000 arms and eyes that was nearly 600 years old. Told by a guide that the fresco was fading and that nothing could be done about it, Yang decided she would create a glass Buddha based on that image. She created 2meterhigh crystal Buddha and then another from polyester that stands 5 meters tall, which she donated to a monastery in Taiwan. “We believe that compassion should be the only meaningful message delivered to the world,” says Yi. Yang’s gift is to create little islands of tranquility like this one that are refreshingly peaceful in our busy modern world. 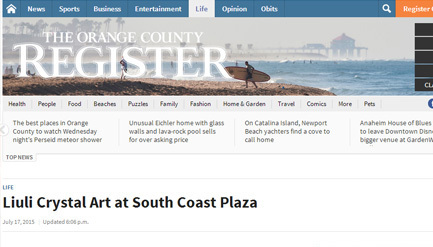 tips.The Orange County Register is a three-time Pulitzer Prize-winning newspaper focused on serving Orange County and helping it thrive.The newspaper portfolio includes two-dozen community newspapers serving Orange County’s 34 cities and Spanish-language weekly UNIDOS.